Cats have lived side by side with humans for thousands of years, but they've always been silent partners. Owners, even veterinarians, assume that they know what's best for these domestic pets, but do they? Animal communicator Kate Solisti-Mattelon explains how cats would answer such questions as What's the best way to train a cat?, Why do cats like catnip?, What is the meaning of life?, and Where do cats go when they die? Armed with a mission to help humankind lead lives of balance and love, cats offer their sometimes surprising insights. Cats have lived alongside humans for thousands of years, but until now, they've remained silent partners. 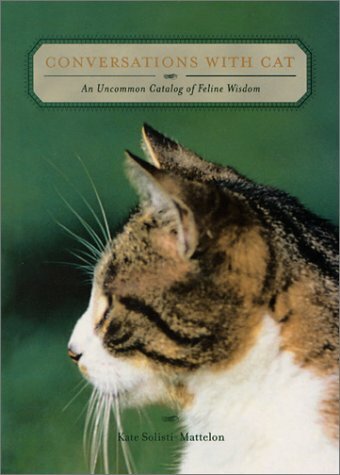 In Conversations with Cat, professional animal communicator Kate Solisti-Mattelon poses some of life's most challenging questions to our feline friends, and the cats' responses offer surprising insights into the spiritual, physical, and mental awareness of our feline neighbors. Cat people won't be surprised to learn that by connecting with our cats and being humble enough to understand how they perceive us, we can actually learn more about ourselves and begin to model cats' examples of detached love in our human an animal relationship. In addition, Lynda Niemeier's photography captures the essence of cat, making this book the perfect gift for anyone wishing to understand more about these beautiful creatures. Conversations with Cat contains practical information that will help cat owners solve misconceptions and correct misinformation about cats. It goes beyond the practical to provide insight into the relationship between human and cat, cat and God, and human and God. This book is as irresistible as a dear feline friend.